Updated Monday, Dec. 28, 7:00 am E.T. From Imam Hussain Square to Freedom Square, from east to west along Revolution Street, the political and religious symbology of Iran's Islamic regime was turned on its head on Sunday, Dec. 27. Hundreds of thousands of opposition supporters brought Shi'ite tradition to bear against an increasingly brutal government, and the blood of martyrs was once again spilled. Reports had at least five dead. One of those killed was the 35-year-old nephew of opposition leader Mir-Hossein Mousavi. Witnesses say one woman was run down and killed by a Basij member driving a car. And Monday saw a number of opposition figures arrested, including senior aides to Mousavi, as well as reports of more clashes. The opposition website Norooz claimed that police had fired tear gas to disperse a group of Mousavi supporters who were demonstrating outside the hospital where the opposition leader's nephew Seyed Ali Mousavi had been kept. Sunday's events came on the mourning day of Ashura, the most important day on the Shi'ite calendar. It marks the death of Imam Hussain, whose martyrdom at the hands of Caliph Yazid is the religious foundation of the Islamic Republic's generalized stand against what it calls the "global arrogance." "This month is a month of blood. Yazid will fall!" came the cry from the steady stream of thousands of opposition supporters filing down Revolution Street  Yazid referring to the unjust Caliph now equated with Supreme Leader Ayatullah Ali Khamenei. Such shows of direct opposition would have been unthinkable a year ago, as would the necessity of government-sponsored counterprotests in support of Khamenei. Filing out of Tehran University's east gate, 2,000 government supporters, men strictly separated from women, shouted a well-rehearsed slogan in favor of ideological totalitarianism: "Our leader only, Seyyed Ali, our party only, the party of Ali." After Saturday night's savage crackdown in Jamaran, again today the worst was not long in coming. By the middle of the day, Ashura 2009 had produced its own martyrs. As the growing crowds approached the Hafez overpass, a shout arose to take the bridge. Hundreds streamed into the road. But the same moment saw the first wave of police attacks. More than a dozen police bikes drew up to the crowd. The lead rider pulled out a tear-gas pistol and shot into the crowd at close range. Pandemonium ensued. During earlier protests, chants of "Death to the dictator" would have been heard  calls that automatically follow scenes of open police brutality. But today something snapped. "Death to Khamenei" was the call of escaping protesters. Crowds scattered. Police singled out individuals and showed little mercy with their batons and whips. An officer was severely beating one man repeatedly over the shoulders and head as he crouched in the dirt by the sidewalk. A woman in a chador tried to pull him away, but she became the officer's next target. Somehow, though, the policeman found himself alone, and enraged protesters assailed him with rocks. One man hurled half a brick at his helmet from a distance of less than a yard. In the back alleys, a tall, well-built man who had been severely beaten walked, head held high, alongside his wife. Blood streamed from a growing bulge on his forehead. He smiled. Perhaps he had given as good as he had received. Many had now been forced away from the main route and were heading west via other routes. The next major gathering was at the junction of Valiasr Street and Taleghani Street, where young men were urging thousands of still tentative protesters to join the main crowd of tens of thousands. At the center of the throng, a whirlpool of arms flailed in the air and crashed down on chests  a sign that not only the government but the green movement too could use Shi'ite traditions to stir passions. Twice, police charges were forced back by the sheer weight of numbers and the readiness like never before of protesters to confront security forces and throw rocks. "This is a civil movement," said a youth juggling a jagged piece of rock in his hand. At one of the many Ashura refreshment stalls placed incongruously in the heart of the battle, a man described a clash he had just witnessed. He said the crowd had taken down one policeman and lifted his helmet in the air like a trophy. Others at the refreshment stall listened as they ate lentil soup and drank tea with dates. No more than 100 yards away, police clashed once again with protesters, while the black-shirted, chador-wearing Shi'ite faithful gathered around the stall cried, "Death to the dictator!" Farther west but still to the north of Revolution Street, Farmers' Boulevard was heavy with traffic and alive with the constant monotonous din of honking horns. The junction of Workers' Street was the scene of possibly the largest gathering of the day. Thousands were already marching toward Revolution Square directly to the south. In the middle of the road, protesters were encouraging a crowd just as large to join the main crowd farther down. On the traffic island, six men considered cutting the wires to the traffic lights to induce further chaos. "Does anyone have any pliers?" a man asked the stationary motorists. Rhythmic, deep booms came from the north like the sound of thunderous footsteps. Again the protesters were reclaiming religious practices. This time they had improvised the battle drums associated with the Ashura festival with metal trash cans, which they wheeled down the street and pounded with heavy planks of wood and lumps of concrete. 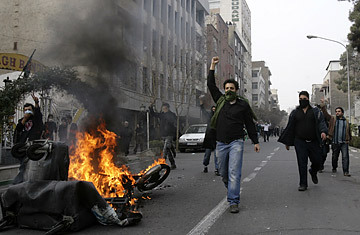 Tens of thousands of Iranians brandishing green ribbons and bandannas followed the war drums down toward the square. On the corner, a billboard bearing the image of Ayatullah Khomeini looked on benevolently. That crowd never made it. Ripples of fear prompted a stampede after a concerted police charge. Tear gas and batons held the day once more. But word later came through that many had in fact reached Revolution Square and some had even gone to Tehran's iconic Freedom Monument. On Sunday, Iran's opposition made the symbolic journey from a square named after its most revered hero toward a monument dedicated to freedom, along a street called Revolution. The last remaining protesters used V signs to hail their taxis home. See pictures of the funeral of Grand Ayatullah Montazeri.